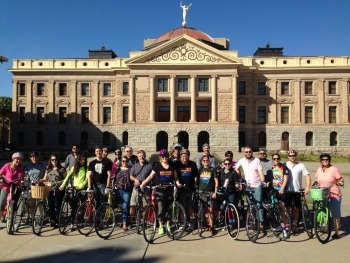 Along with Bill McComas and Lisa Parks, in 2012 Warble formed the group now known as the nonprofit bicycle advocacy group Phoenix Spokes People. Courtesy of Phoenix Spokes People. “We raised the budget for bike lanes to $1.5 million in our first year,” Parks said. Today, Phoenix Spokes People regularly work with city officials and downtown Phoenix business leaders advocating for bicycling in downtown Phoenix. They create bicycle-related events and tirelessly promote cycling as a valid alternative mode of transportation. 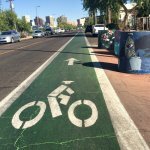 The new, bright green bicycling lanes in downtown Phoenix can be traced to their efforts. “We went and stood up and said we need more money for bike lanes. That’s how people know who we are,” said Parks. Another major result of Phoenix Spokes People’s advocacy is the development of the Comprehensive Bicycle Master Plan, released by the City of Phoenix in 2014. It created a plan that by 2034 would turn Phoenix into a “platinum-level bicycle friendly community,” Parks said. 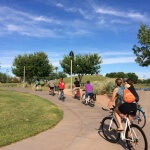 According to the Comprehensive Bicycle Master Plan, Phoenix currently lacks a comprehensive bicycle network that connects the community with other transportation networks. Despite having 700 miles of bicycle facilities throughout Phoenix, this only represents a small fraction of the 5,000 miles of street network. While the program is still ongoing, Phoenix Spokes People is dedicated to holding the city accountable to the program. Phoenix Spokes People’s main focus is advocating for bicycle-related construction projects that will link people and places. This includes more projects like the “Bike Boulevard” which created 4.6 miles of bike lanes, bike dots, shared lane markings and guide signs from 20th Street and Roosevelt to Central and Van Buren Street. As of 2014, 1.2 percent of Phoenix commuters commuted by bicycle and only 33 percent of arterial streets had bike lanes. 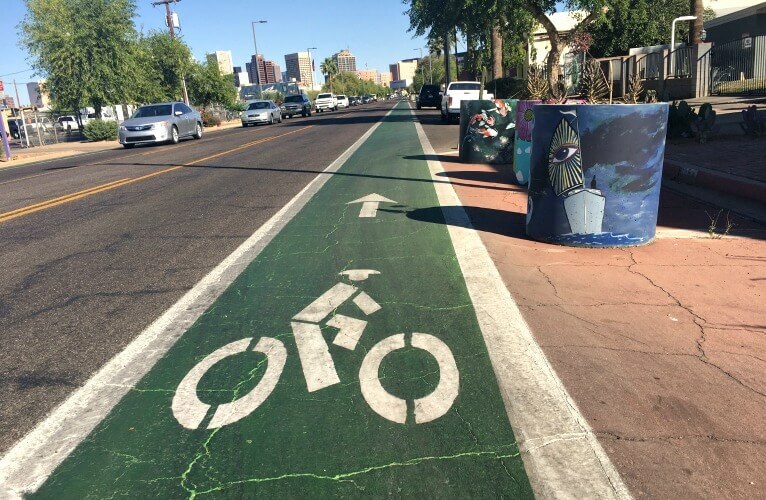 To reach its platinum status goal, Phoenix needs to increase daily bicycle commuters to 12 percent, and 78 percent of arterial streets must be equipped with bicycle lanes. Phoenix Spokes People say their work is just beginning. “There are a lot of great projects in the pipeline but they’re just not done yet,” says Phoenix Spokes People Vice President Bill McComas. “Getting more people involved instead of saying Phoenix doesn’t have the bike infrastructure [will make the difference],” says McComas. While Arizona is ranked as the 19th most bicycle-friendly state in the nation, the city of Phoenix received the lowest ranking – bronze – for its unfriendly bicycling community, according to report card for Phoenix by the League of American Cyclists. That low rank is due to a high volume of bike-related accidents within Phoenix, averaging 445 per year compared to a national average of 180. 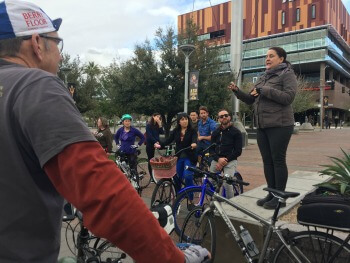 Phoenix needs to increase daily ridership, lower the number of crashes involving bicycles, and add safety measures like education to prevent bicycle-related fatalities, according to the cyclist group. 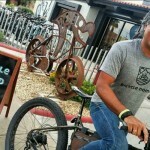 “Phoenix Spokes People has been at the center of many changes here in Phoenix,” said Joe Perez, the City of Phoenix bicycle coordinator. 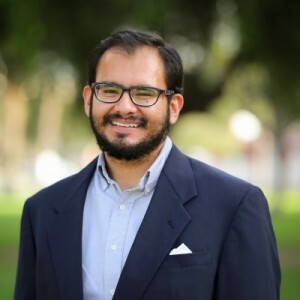 “It was during 2012-2013 budget hearings, when Phoenix Spokes People was a new organization, that it successfully persuaded city leaders to increase the budget for bicycle lanes in central Phoenix,” Perez said. Today, Phoenix Spokes People is pushing along current projects outlined within the Comprehensive Bicycle Master Plan such as the Oak Street Improvement Project. This project plans to add bike lanes, a two-way cycle track and increased signage from 3rd Street and Oak to 24th Street. Phoenix Spokes People’s success comes in large part to the community building bicycle rides they have organized throughout central Phoenix. One of them is the Second Saturday ride in partnership with Bicycle Nomad Café owner Erick Cedeno. Bicycle Nomad Cafe at The Velo bike shop. 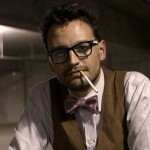 Photo by Courtney McCune. Every second Saturday morning of the month, Bicycle Nomad Café customers, bicycle advocates from Phoenix Spokes People and other cycling newbies meet to ride around central Phoenix. These regular social rides boost community building and cultivate the increased popularity of bicycling culture. They also help create inroads with small business owners and other city leaders, helping to grow Phoenix Spoke People’s influence throughout the city. Among the support for Phoenix Spokes People’s advocacy is community development group Downtown Phoenix Inc. It has also partnered with Phoenix Spokes People to continue fostering a growing bicycle culture in downtown Phoenix. Phoenix Spokes People and Downtown Phoenix, Inc. partnered to start the Downtown Pedal Around ride on Sunday evenings. 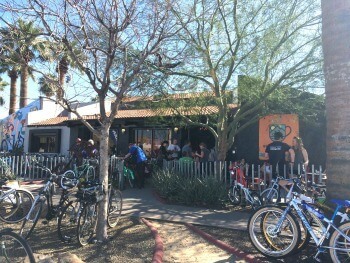 “From our organization’s perspective it was about community building, safety and teaching people how to ride safely in an urban environment,” said RJ Price, vice President of marketing and events for Downtown Phoenix Inc.
“Besides the obvious sustainability gains with lesser cars on the road, small businesses tend to thrive in areas with more bicycle traffic,” Price said. Some bicycling commuters are still unhappy with the advances in planning and construction of bicycle infrastructure within the City of Phoenix. According to longtime Phoenix cyclist Marco Perez, crossing large intersections and even going from one side of downtown to the other can be dangerous if inexperienced cyclists take to the road. Perez questions whether the city is building the bicycle lanes with cyclists in mind. Perez explained that because Phoenix has such wide roads, it encourages motorists to drive much faster than usual. Studies have shown that narrower roads cause motorist to drive much slower he said. As far as educational literature for the motorist community, Bicycle Coordinator Joe Perez acknowledges that there could be more information distributed to that community. “There isn’t much for drivers or for older adults to explain cyclists’ rights,” said Perez. The amount of bicycle lanes in central Phoenix continues to be bogged down in transportation subcommittees Phoenix Spokes People said. “We’ve been doing this for awhile…and we’ve been seeing changes slower than what we want to see,” said Parks. Phoenix Spokes People leaders agree that changes were implemented because of their regular attendance at city government meetings. Lisa Parks, co-founder Phoenix Spokes People. Photo by Edder Diaz Martinez. After the increase in the bicycle lane budget and the creation of the Bicycle Master Plan, they are constantly monitoring transportation and infrastructure subcommittees for the newest introduction of bicycle projects in the downtown area. Once membership discovers a potential bicycle project discussion, they post it to their social media. They then focus on turnout for the meeting, encouraging members to submit their input to the City of Phoenix Transportation & Infrastructure Subcommittee. Phoenix Spokes People highlights attendance at government meetings as their strategy for success. Through their constant visibility effort, elected officials like Mayor Greg Stanton and Retired Deputy City Manager Rick Naimark have publicly supported their advocacy. Phoenix Spokes People realize they have a mighty task ahead of them. One of the ways they began to tackle the issue is by recruiting new members in the organization. This spring, membership recruitment was overhauled by creating new Phoenix Spokes People memberships. With the purchase of a new membership, one is entitled to bicycling perks around the Valley. 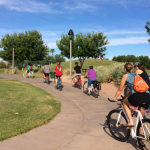 Parks mentioned that the rise in popularity of bicycle culture in downtown Phoenix was due to an overall generational shift in the city. When the city was first built in the fifties, many wanted wide roads and sought open spaces to drive their suburban automobiles. Today, the landscape and demographic of the city has shifted. There is a greater desire for sustainability, health and integrated methods of transport.